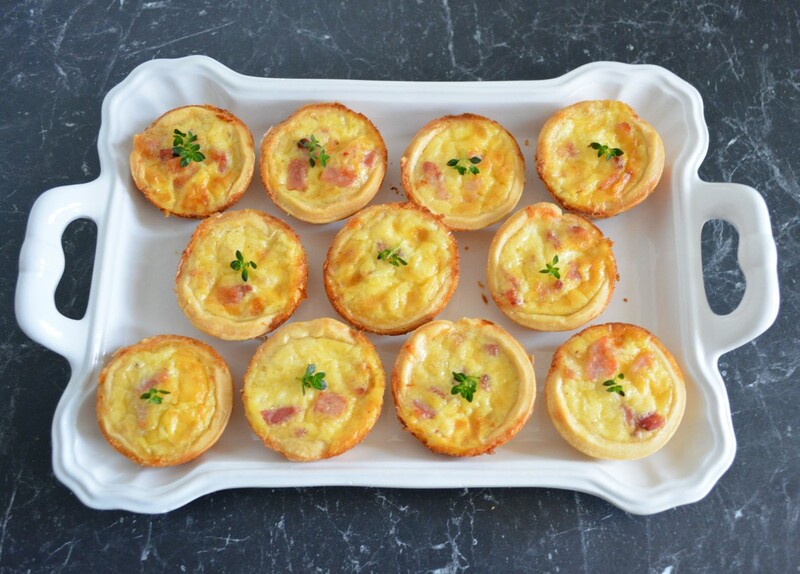 I love quiche and I just love these mini quiches. This is something I love seeing at parties, little bite sized perfect snacks. This recipe is an easy one. The pastry is made in a food processor in about a minute. 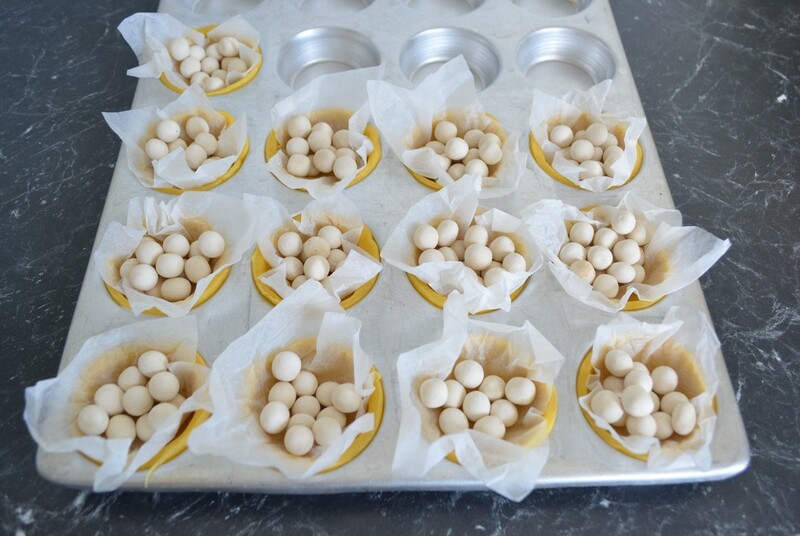 It is easy pastry to work with, rolls easily, goes into the moulds easily. Bakes well, doesn't shrink, and tastes so good. The filling, super easy to make and is delicious. You can make the pastry in advance, just fill and bake when needed. 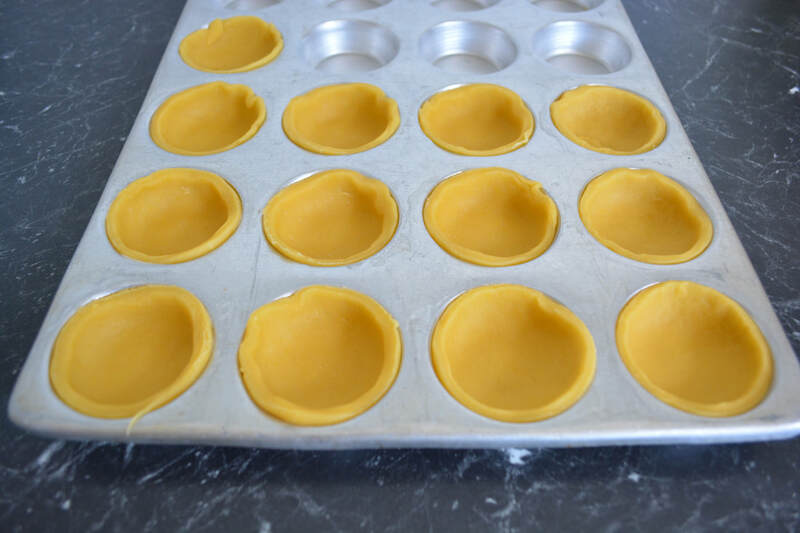 When rolling the pastry, roll it very thin, it puffs up a little when baking, so you want thin cases, so you can actually fit in some filling. After you first cut rounds out of the pastry, re roll the scraps, but knead a little first. This second roll, the pastry can be a little harder to work with, if it tears when placing in the moulds, just stick on a small piece of dough and push it in to cover the tear. It is really important to refrigerate the dough once you have put it into the moulds. And it is really important to blind bake the cold pastry, both of these steps will stop the pastry from shrinking when baked. 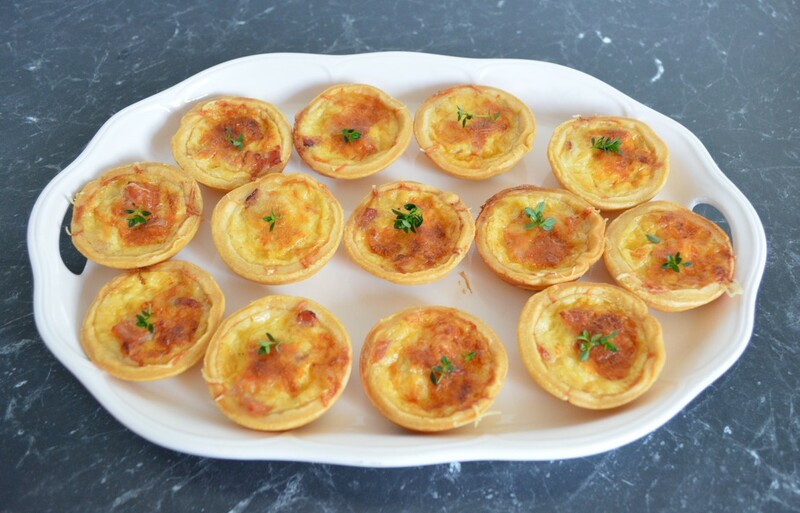 In Manu's original recipe he makes a large Quiche Lorraine, but he only used 1/2 of the shortcrust pastry. 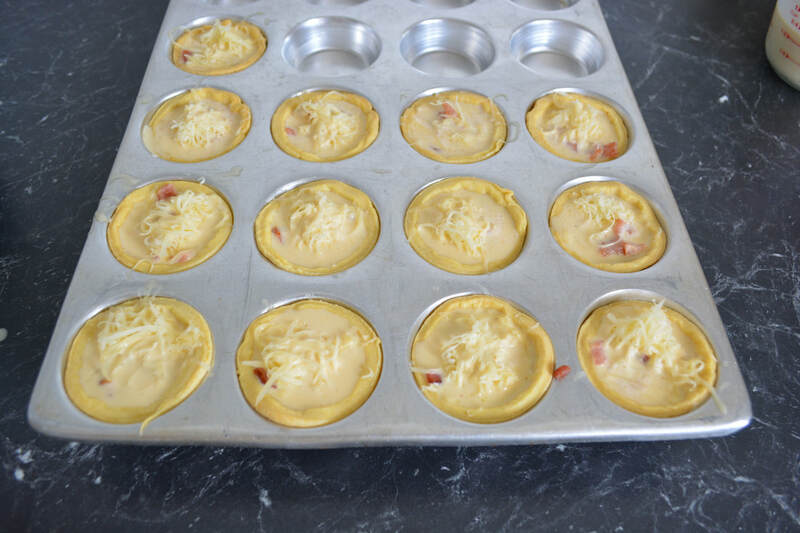 So with the remaining pastry I decided to try these mini quiches. Now if you are only using up the remaining pastry for this recipe, you will have leftover filling. You can just use store bought shortcrust pastry for the extra filling. If you are looking for something delicious to serve at your next party, look no further, you have to try these. Roll out the pastry between two sheets of baking paper until about 2-3mm thick. Using a 7.5cm round pastry cutter, cut 24 rounds from the pastry. Press the pastry into your prepared tins. You can re roll the pastry, knead a little first, if you didn't get 24 circles from your first roll. Refrigerate for 30 minutes. Preheat oven to 190C/170C fan forced. Lightly grease 2 x 12 hole, patty pan tins. Cut 24 x 6cm squares out of baking paper. Scrunch up the pieces of the baking paper and place them in each of the pastry circles. Fill the paper with pastry weights, dried beans or rice, all the way to the edges. Blind bake for 10 minutes. 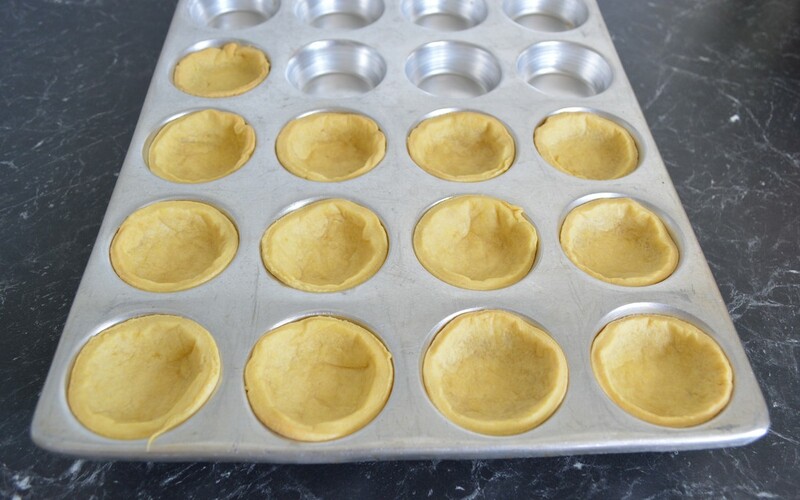 Remove the paper and weights, then reduce the oven temperature to 180C/160C fan forced and bake the pastry for another 5 minutes or until it is dry and light golden. Remove from the oven and leave to cool for 5 minutes. ​Meanwhile, heat the oil in a frying pan over medium heat. Add the bacon and cook, stirring often for 5 minutes or until golden. Drain on a paper towel. 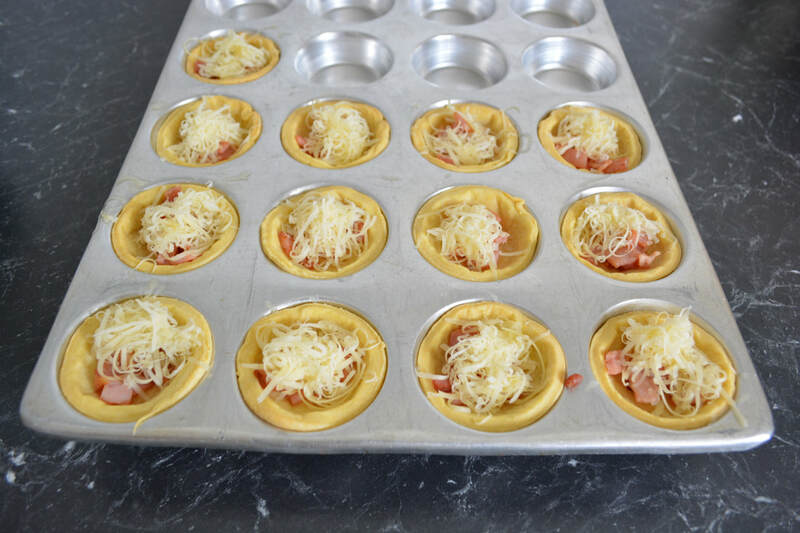 Evenly distribute the bacon and grated cheese between the pastry. ​ Carefully pour the mixture into the pastry and bake for 18-20 minutes or until just set. Start checking from 15 minutes onwards. ​Scatter over the thyme leaves and serve.